In this review I look at Etihad’s Business Class product on the A380 from Abu Dhabi to London Heathrow. This was in fact the second leg of a two part Etihad journey which started in Hong Kong. You can also read my review of the Hong Kong to Abu Dhabi in Etihad Business Class. 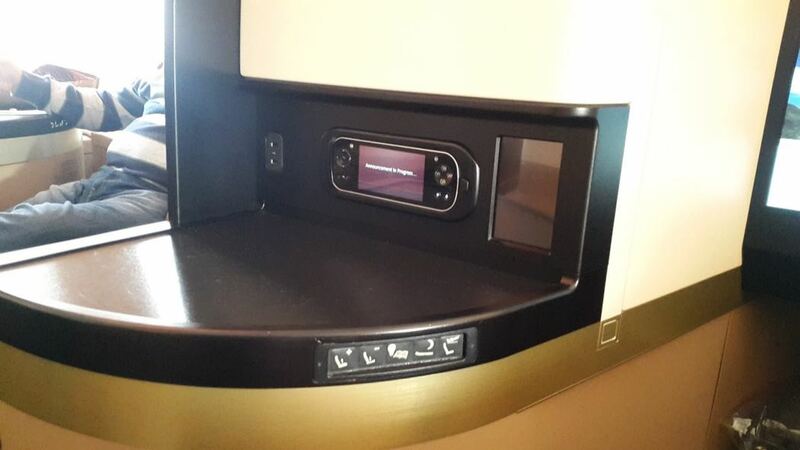 You can read all my Etihad flight reviews in Business Class to get a clearer picture of the product. Etihad and Qatar are definitely the best Middle Eastern airlines to fly on, with Emirates coming in third. To find out more read my comparison of Etihad vs Emirates Vs Qatar Airways. Business Class gave us priority check in and boarding at Abu Dhabi which is a relief with 480 people waiting to board. First Class & Business Class is boarded on the Upper deck, which makes you feel very superior until you see the cabin, divided into 2 sections, with 9 First Class seats and a huge 70 Business Class seats. The seats are in a dovetail design with forward and rear seats offering increased personal space. The 22 inch wide seats are very comfortable and you can put your feet up in a “hole” where your feet go when the seat is converted to a bed. The seat converts to a comfortable fully flat bed of 6’8”. Seats on the aisle have a small sliding privacy screen, and there is concealed storage, meal table, and a separate side table for personal belongings and laptops when dining or sleeping. There are personal lights (rather low level), water bottle, .socks, amenity bag with nice lip salve and face cream, 15.4” touch screen TV and magazines. 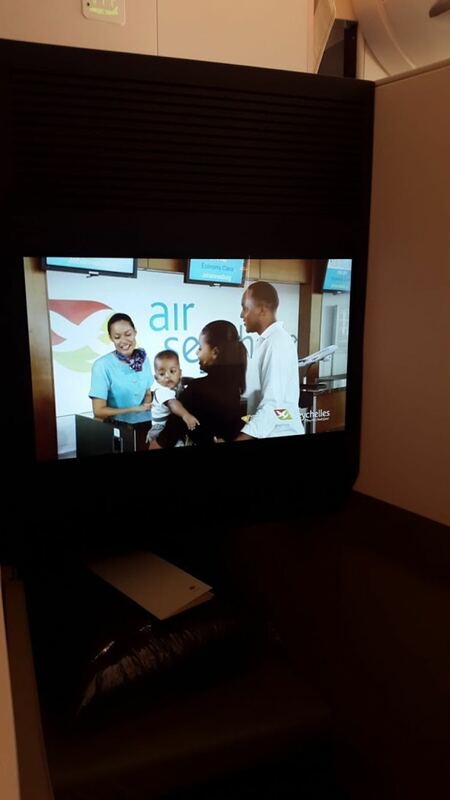 There is also a lobby area between Business and First Class which has comfortable seating for 6 guests and is fitted with seatbelts, power supply and connectivity points. We were at the front and I did not see this being used. I personally didn’t like the luggage compartment which was very small and hung down head-high above the seating area when opened. We were offered orange juice while waiting for take-off, then the steward brought the breakfast menu and offered us drinks and snacks. I chose when to be woken (2 hours before landing) and gave the steward my breakfast order. Then to sleep, I was, exhausted and hardly noticed the mood lighting, but did enjoy the huge furry rug which allowed you to snuggle down and tuck your feet in and the pillow was reasonable. Breakfast was delicious and beautifully served with hot rolls (see menu on scroller below). However items were forgotten which was disappointing. I had to remind the steward to bring milk for the cereal, and we were only given one cup of tea. The staff were very nice, but with so many people it was not nearly so personal as on the A330 we took for the first leg of our journey. I managed to sleep, so from that perspective, I can recommend this flight. I liked the tv, you could watch the plane take off and land via the external tail mounted cameras (landing was exciting as it was daylight) and there was information about where we were and how long to landing etc. Taking off was a bit hair-raising, we trundled along the runway for an age before taking off and we began to wonder if we would run out of runway! The landing at Heathrow was absolutely perfect, we hardly felt us touch down. All in all, this experience of Etihad Business Class resulted in decent sleep but was let down by the breakfast service. 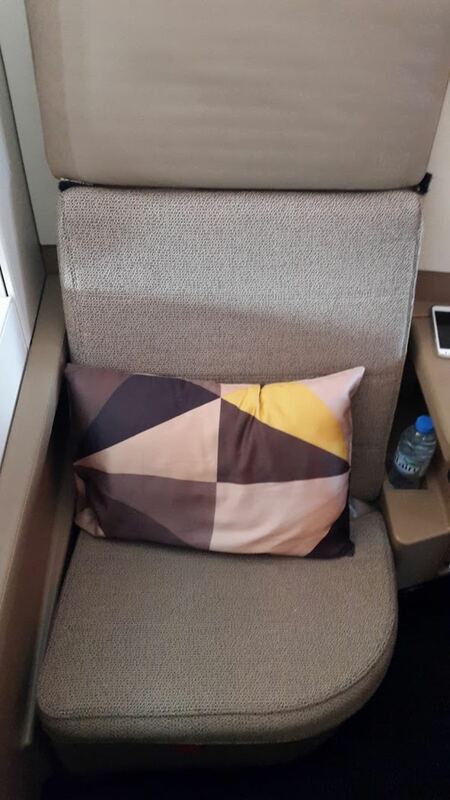 Find out what Etihad First is like on the A380 (with onboard shower!). I have also reviewed Etihad Business Class on A330, Etihad Business Class on A380 and Etihad features in my top 10 Best Business Class airlines for long haul travel. 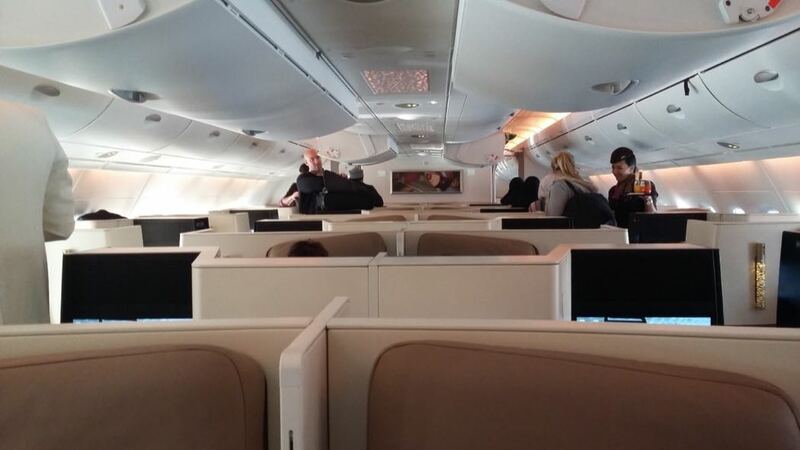 Read all my other Etihad long haul Business Class flight reviews.